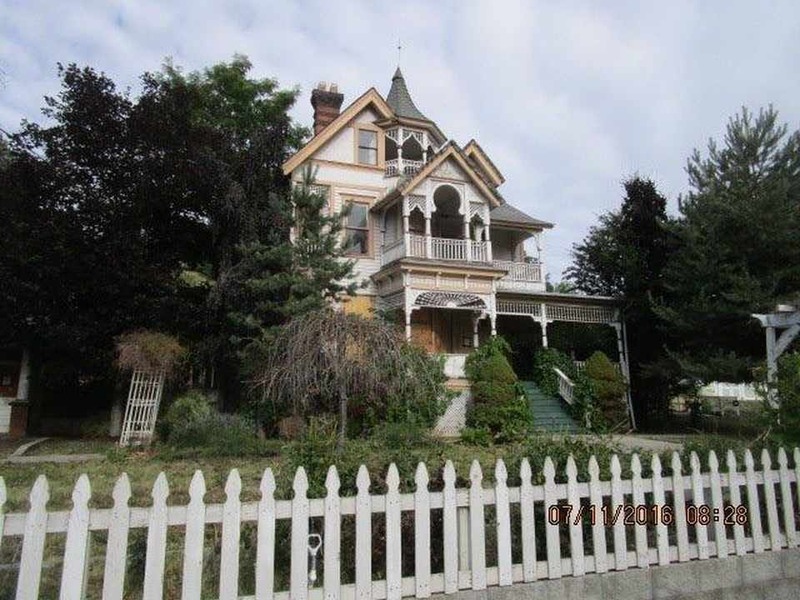 This is one of a kind Victorian with great views of Lake Ewauna. The home needs lots of TLC - once restored it will be a Masterpiece. Please call for details. 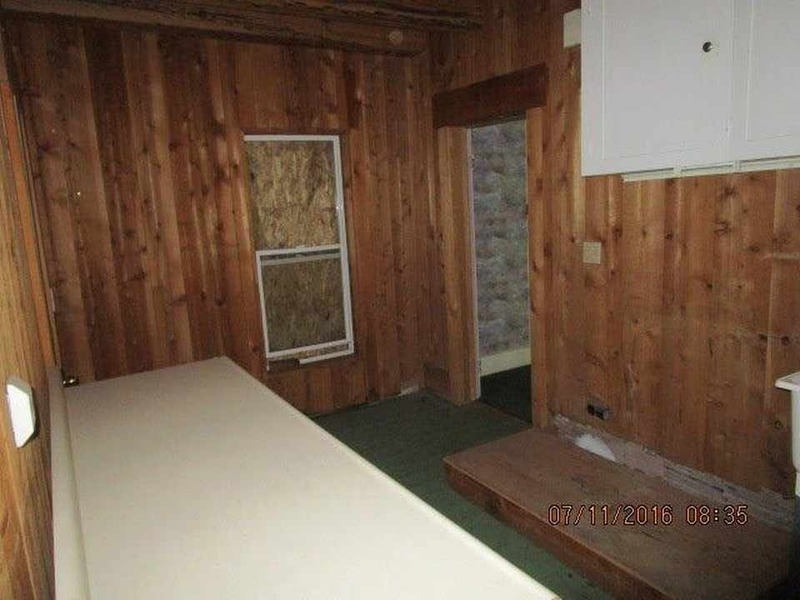 Bargain basement price for almost anywhere in Oregon, IMO. Will need lots of work and maybe a spiritual cleansing (easily available in New Ager/Hippie haven Oregon-bring your own sacramental sage) Seriously, how completely disrespectful for some bored kids to tag the walls with crappy satanic junk. This fine example of George Barber design could be the pride of the neighborhood again and it should be. Mantel appears gone and maybe part of the staircase? Thanks Jim. It may still be there but usually if a mantel was taken out, (and at least one is missing here) things like newel posts are carted off as well. There’s a large architectural salvage business in tiny Aurora, Oregon, near Salem. I visited the business one time and noted it carried high end items one seldom sees in Oregon. When I inquired further I was told truck loads of salvage are being hauled in from the Midwest on a regular basis and that sales were brisk for the high-end stuff. Here’s their website: http://auroramills.com/ Shouldn’t be too difficult to find a suitable newel post if the original one is now gone. I’m amazed that some of the stained glass pieces appear to be extant. Unfortunately, the Aurora Mills Salvage store has gotten more than a little expensive in the last couple of years. They still have a great selection of salvage though. Hippo Hardware in Portland has a lot of salvage too and decent prices. 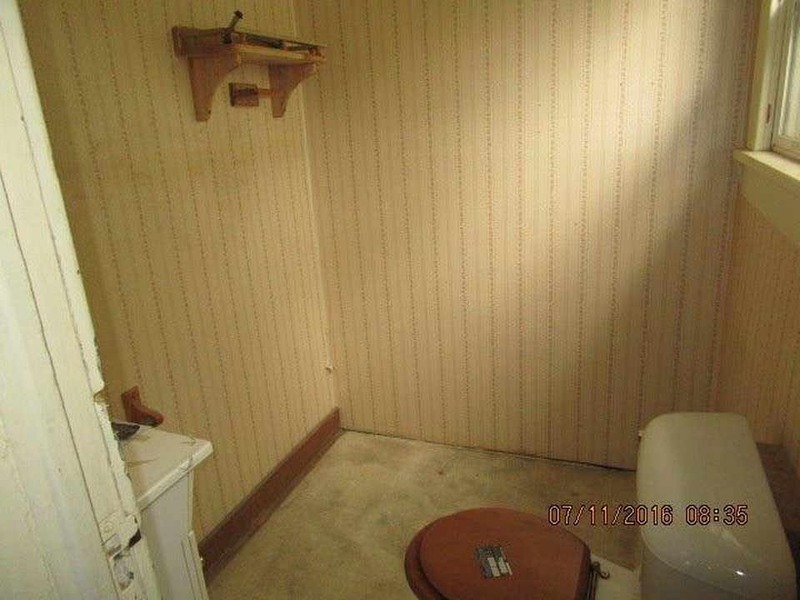 I’ve seen pieces that would complete some of the missing pieces of this house there…as well as appropriate lighting. http://www.hippohardware.com the website isn’t great but they have lots and lots to look at. This house is unfortunately in such a bad area. Klamath Falls has a terrible reputation for meth addiction. 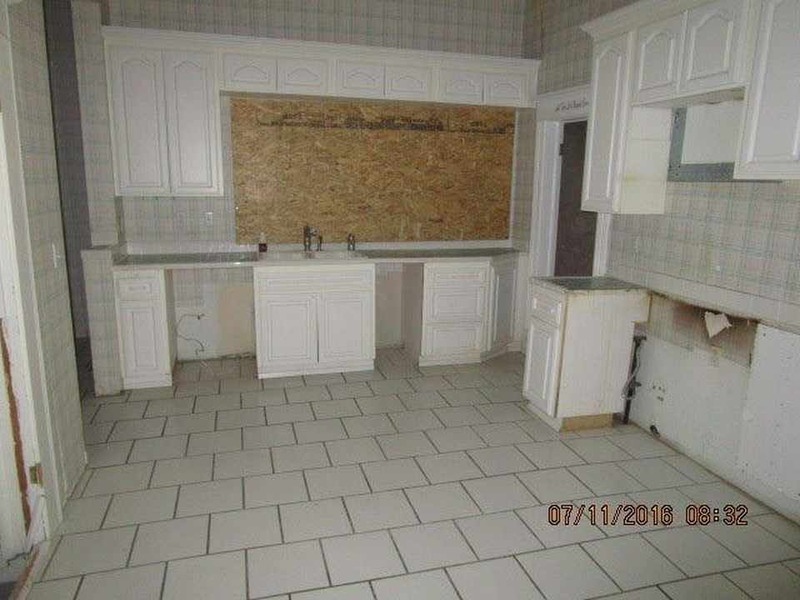 Hopefully, the city will start to turn around in the next few years but as it is now, the state of the city is surely the reason for such a reasonable price on this house. 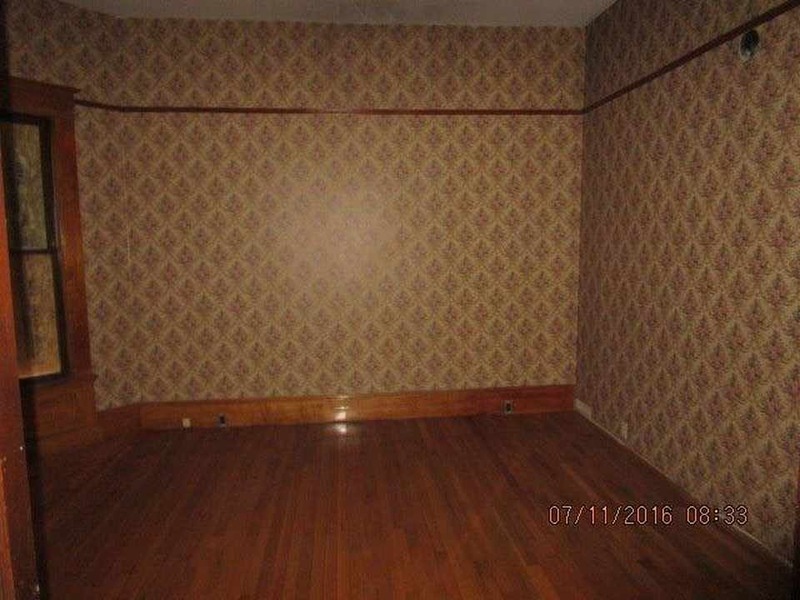 John, its funny but when we sold our Indy house the buyer wanted us to sign a “spiritual disclosure” that to our best knowledge, there were no ghosts or spirits in the house. I could not stop laughing over that one. If you are worried about ‘spirits’ maybe you should build a new house? That being said, HOLY (potentially) GORGEOUS HOUSE!!!!!! The outside of this home reminds me of the house in ‘Practical Magic’. It is beautiful. The whole neighborhood has homes that need restoring. Just a bit down the road is a big home with a Turkish looking turret. From the satellite view it looks as if there is virtually nothing behind it beyond a small neighborhood. I wonder if you can hear the thru way? 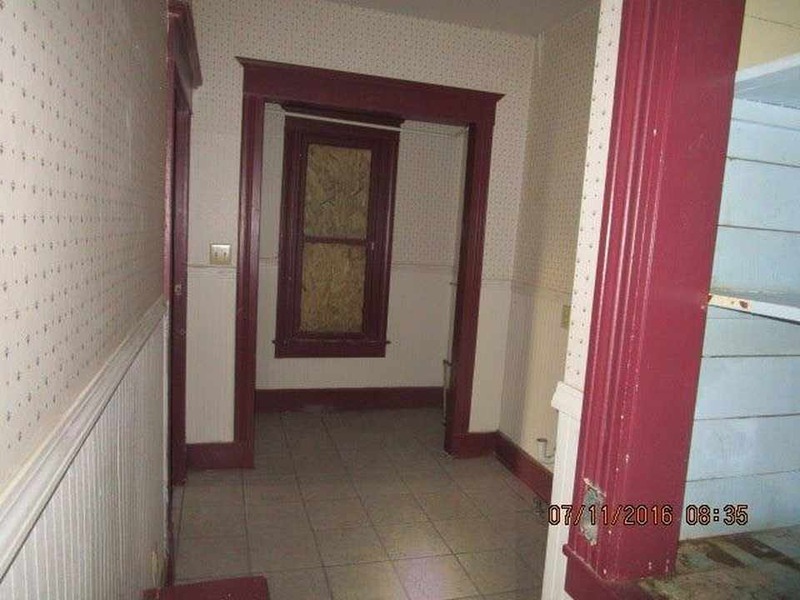 Someone please buy this house and love it back to it’s original condition! Can’t be too bad of a neighborhood as I see in streetview the Klamath Falls new Chamber of Commerce building almost directly across the street. Just down the block is what appears to be a new art gallery, Hardly what one would expect of a bad neighborhood. But Klamath Falls itself is somewhat remote. It’s in far south Oregon in what appears to be near the Siskiyou Mountains and on the map are many nearby state forest areas, a river within a stone’s throw, and a large lake. Portland is 280 miles away and it appears the Pacific coast is 100 miles or more to the west. However, Klamath Falls is bigger than I expected with 21,000 residents. The California border seems to be maybe 25 miles or so away so San Francisco would be within a day’s drive via I-5. Elevation is just over 4000 feet which translates to cooler winters. Please edit out this comment if you feel it’s inappropriate as we have had a difference of opinion on this topic before but when this house was posted previously I did some preliminary research with intent to purchase however based on my findings I think its odd in a city of only about 21000 but it’s important to mention that in reply to John’s comment and echoed on several independent online reports that in terms of crime? Klamath Falls ranks number 4 in the top 10 of most dangerous cities in the state of Oregon to live and also boasts extremely high crime in terms of national statistics. I would caution that interested parties research this aspect as carefully as they would the structural integrity of the home itself. The exterior looks to be in better shape than I expected. Most of the spindles and fretwork are there, just a few missing pieces. I can’t imagine it would be too costly to replace the missing pieces. I would love to see a different paint scheme on the exterior. “The NRHP listing on the Goeller House expired after 15 years and was not renewed.” There are no expiration dates on NRHP listings and a structure remains listed until it is demolished or seriously altered. 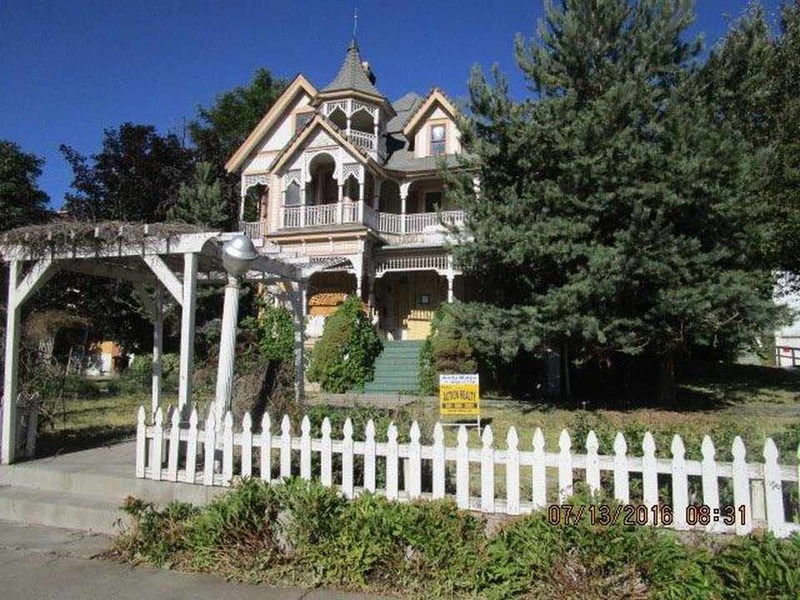 It has been claimed that the house was designed and built by Fred Goeller beginning in 1900 shortly after he arrived in Klamath Falls, and was completed in 1905. At least some of this came from a recollection by an elderly Harry Goeller (1888-1974), the builder’s son, who said he helped build the place. Maybe he was using his father’s nickname, but for the record he was John Frederick Goeller (1860-1935). He was a butcher’s son born in Ohio, he worked as a carpenter, married in Kansas, and went to California before 1890. In the fall of 1891, John F. Goeller was in Klamath Falls and purchased an interest in a wood milling business. He was full owner by 1896 and the firm did all types of millwork for construction, including window and door manufacture, and sold a full line of finishing products including paint and wallpaper. Until 1920, the Goeller company was a supplier for most construction in the Klamath Falls area. Census records prove that the Goeller family lived at the location of the house by 1900, and that their neighbor was Charles H. Withrow, who had been one of Goeller’s business partners in 1893. It’s quite likely that they lived here from their earliest years in town and that this house was built on adjacent property. Given the timeline and fact set, I think it’s improbable that the house was built after 1900. Goeller used plans published by George F. Barber in 1891, with only minor changes from the published design at the rear of the house. It’s clear that Goeller had the resources and ability to build the house in a short time when the design was current. With due respect to Harry Goeller, I think he probably did help his father build the house but at a younger age than he recalled many years later. A rare and magnificent house important to local history that needs a very capable new owner committed to a long term project. A photo of the nice detail and stained glass at the front door. 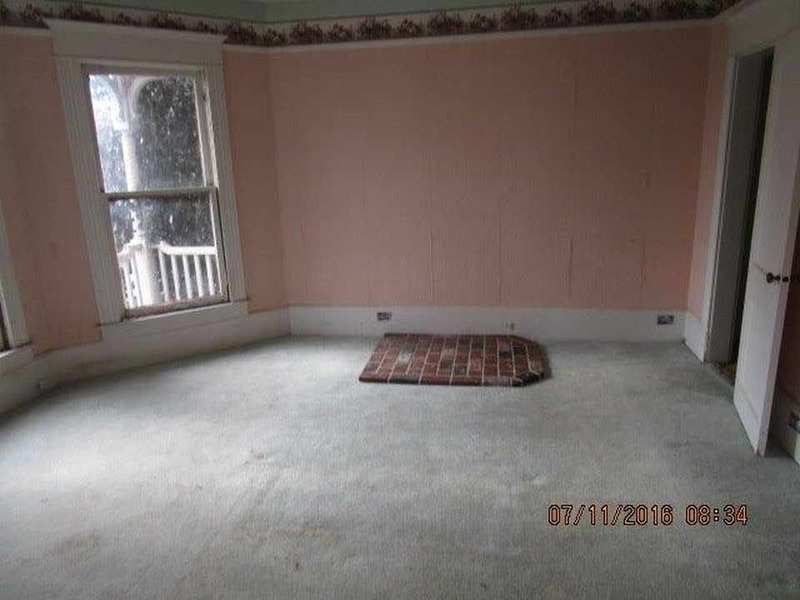 Jim, Thanks for going to the extra trouble to research the Goeller Family connection with this house. Given the somewhat remote location of the town, the fact that rural areas are often the last to declare a style obsolete, and because there are some documented examples of Barber designs built in the early 1900’s from Cottage Souvenir No 2, a post 1900 date seems at least possible; but combined with the information you found, it now seems more likely that it dates a few years earlier. One of the least reliable resources for determining house dates are people’s memories. If a house was built just before someone was married or some other date that is easy to pinpoint, then its more likely to be accurate. However, here it seems likely the younger Goeller’s memory may have been off by a few years. If there was a town newspaper back then that has survived on microfilm, there might be a specific article about the house construction but that is similar to finding a single needle in a row of haystacks. I am a descendant of the Goeller family and this information is valid. John Fred Goeller was my great great grandfather and his son Harry did help build the home as a young teen and also worked at the J. Fred Goeller and Son Sash and Door Mill. I love seeing the interest in my family’s history, thank you for sharing! Why in the world wouldn’t they have removed that evil graffiti? Is this a very dry part of the state? Zooming out on the earth view on Google, it looks barren. I can’t tell if it’s winter and fields are brown, or if it’s in a state of drought like California. This is a marvelous house and needs to be saved before everything of value inside and out has been carted off. It troubles me that those two lovely front windows are not boarded up. Being at the southern end of OR, it is affected by the drought as much as California. 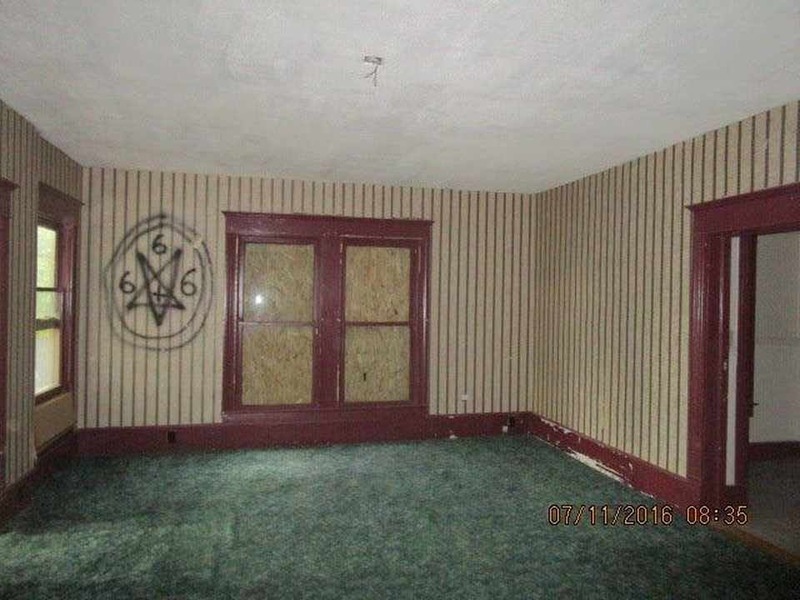 This is one instance in which I think Photoshop would be appropriate, to cover up the pentagram and 666 in a listing photo. Or better yet, actually get rid of the graffiti in the house and take another picture. This is a good price for Oregon & I hope someone fixes this place up to what she can be. Every time I show this house I whish I had a bucket of paint and a brush to cover the graffiti! I just showed it to a builder/investor and his family. I had to give them a PG-13 warning before he took his young kids into the home. 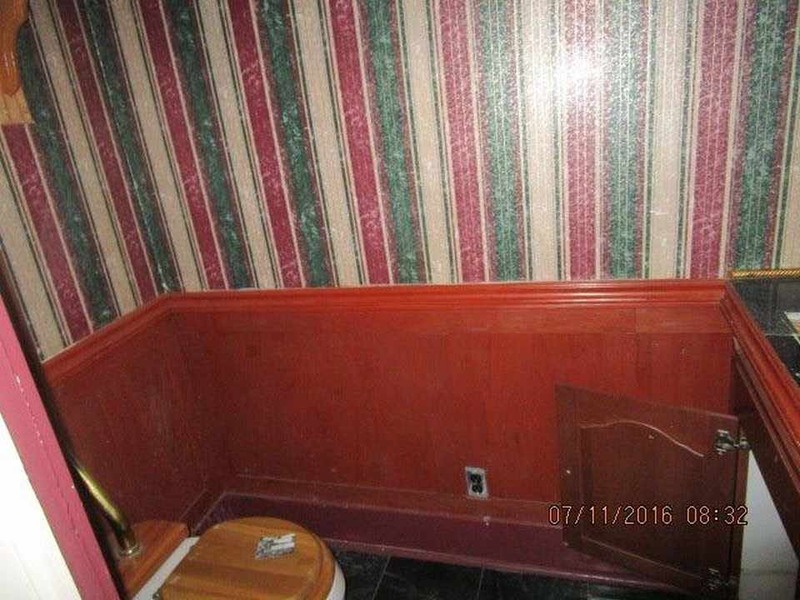 I wish the seller would let us clean it up a bit. I hear there will be an offer this morning from another office. I keep thinking its the deal of a lifetime for the right person. And I hope that person restores it properly as it deserves. It would be a real treasure! This is a beautiful diamond in the rough! 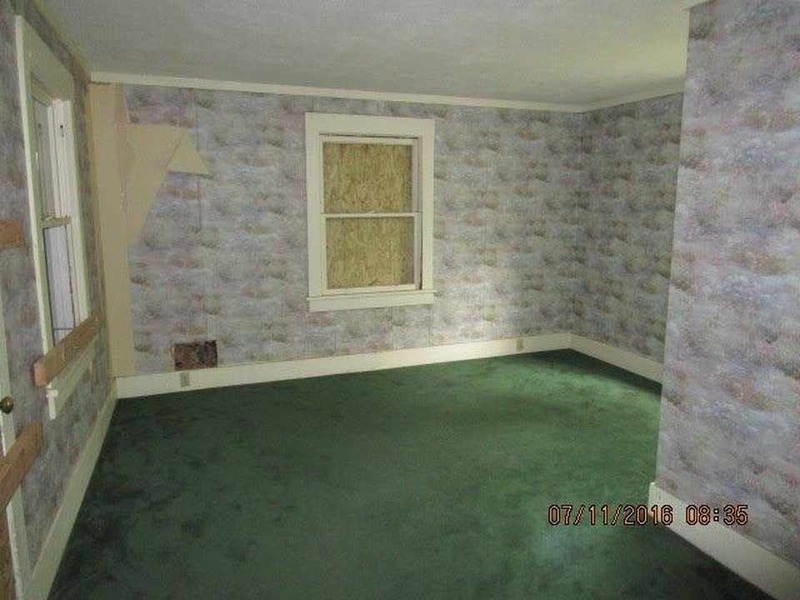 I hope that you do have an offer on this property, Jim. This beauty needs to be respected and made proper again. The term “investor” scares me a little, but then again, it was mixed with “family” which the house would love to have back in it. Stood on the porch of this house a few days ago. It’s very “boarded up” now. I snuck inside once & it was awesome. A lot of work had been done on the 3rd floor but then the roof has leaked since then…. Not surprised it’s been vandalized: when I went in a few years ago, the French doors were unlocked. (They looked like a new addition to me.) I think that happens in ANY town when a building has been vacated & left open. Wish U.S. Bank, who apparently then was owner, had seen to securing it. My daughter lives in Klamath Falls. I am so tempted despite NOT winning the lottery. Even if I die there like Big Edie in Gray Gardens!!! Well Monday morning and no offers yet. I’m really surprised. The home has had many, many showings, many I think were just curious to see a piece of history. In defense of our small town here, I rather like it. After growing up in San Diego, (talk about crime) and living several years in other cities in various other west coast states, I have to say, all things considered, this is one of my favorites for low cost, close to nature, great climate places. And when I need a major city, San Francisco, Sacramento, Reno and Portland are all only about an easy 5 hours away. Surrounded by virgin public lands, Klamath Falls offers many recreational possibilities, including the gorgeous Crater Lake National Park an hour and a half north of us. We are served by a passenger train terminal and will soon have air service restored at our local airport. We are close to Kingsley Field a major Air Guard training base who participate in Top Gun training exercises. Overall its a really great place to live and raise a family. I grew up in San Diego. Live in Poway now. I was surprised by your comment about the crime in San Diego. Selling update. Went to show this yesterday and the preservation company was doing lots of yardwork! They cleaned up a dumpster full of branches and weeds. Walking around the home is so much better after the trimming. Other realtors and I have showed 12 times since it was listed. We only have received one offer that was immediately rejected by the seller. 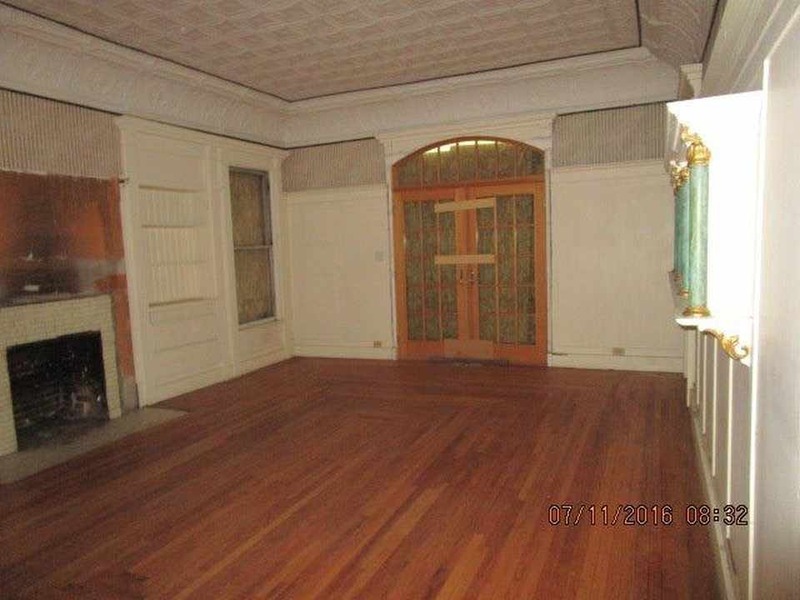 Seems like there aren’t a lot of folks with $134,900 burning a hole in their pocket ready to buy this beautiful old house. With that in mind, I’m researching financing options. Yesterday I pulled all recorded building permits from the county. There have only been three on their books. One mechanical, one for the new deck at the side off the dining room and the one I was looking for, the electrical permit. Seems that the whole house was rewired and brought up to code in 1995. It was updated from an existing 60 amp service to a 200 Amp with new 12 gauge romex throughout. What a big job! That means it wouldn’t be that hard to get the electrical meter put back on with another inspection. I contacted a lender about FHA 203K re-hab loans where part of the money is used to bring the property up to a point where it could finance. I was told that a 203K would work OAC, as they say, but it requires 25% down if non owner occupied and 10% otherwise. So we’ll see. I’m still trying to talk my wife into this one… My sister runs a very successful air b&b with two room renting at $200 a night in San Diego. She’s coming up her next week to visit and she really wants to see the Goeller House in all its splendor! The 3rd floor renovation was awesome, even though modern. It really was a penthouse suite. Interesting you should mention that. I agree, what a great room with a view! The last two clients I showed it wanted to ‘restore’ it. I said but it was just a bare attic, you want to gut it down to the gut it down to the 2 x 6″ rafters and studs? “Yes”, they both said, then it would be original! 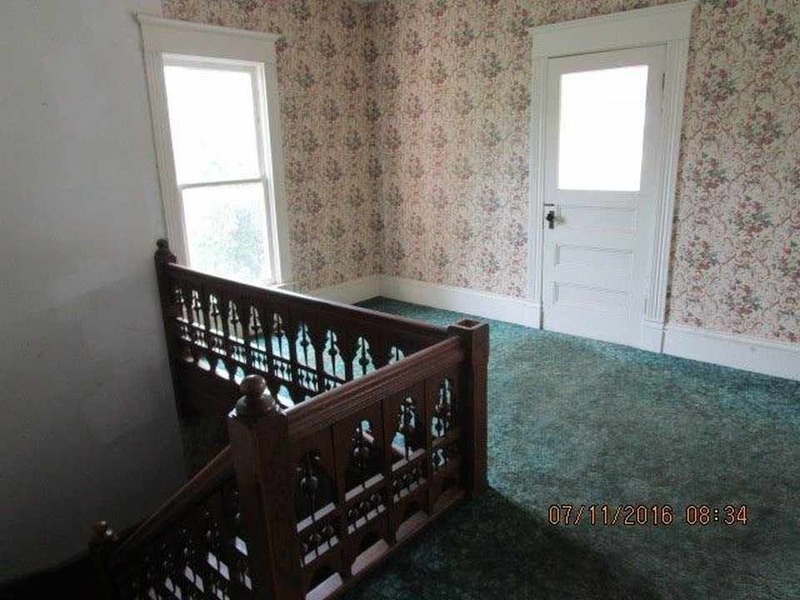 Actually the top floor wasn’t just an attic, it was used as the Goeller family’s “rec room.” I found this out after reading letters and journal entries about the house by my great grandfather, Harry Goeller, John F. Goeller’s son. I’ve seen the 3rd floor remodel and thought it was a shame that it doesn’t match the houses era. Klamath Falls has a high desert landscape. The older part of the city is located above natural geothermal springs . These have been used for the heating of homes and streets, primarily in the downtown area. Klamath Falls is known as “Oregon’s City of Sunshine” because the area enjoys 300 days of sun per year. I wrote the previous owner & she wrote me back: Yes, it was my home and I had completely restored it. I moved to Florida with my husband in 2009 and my husband passed away. I couldn’t handle it all and I lost the house. I don’t know about a value now, I know it’s been terribly vandalized and stripped of a lot of the basics. It will probably take a cash buyer because it will be hard to get it financed. Then take a huge amount to get it back in good shape. I do have a ton of research on the house from when I had it listed on the National Register. I will happily turn them over to the new owner. I have called this beautiful house “my house” for years since the first time I saw it. Each time my husband and I would drive through Klamath Falls on our way from Yreka, CA to Bend, OR to visit our daughter I would request a drive-by, and he would always comply. I knew it could never really be “my house”, but I would have David check on line sometimes to see if it was on the market. One afternoon some years ago when it still looked intact from the outside I walked up on the porch just to “feel” the house, and the side door on the porch was standing open, so I went in. 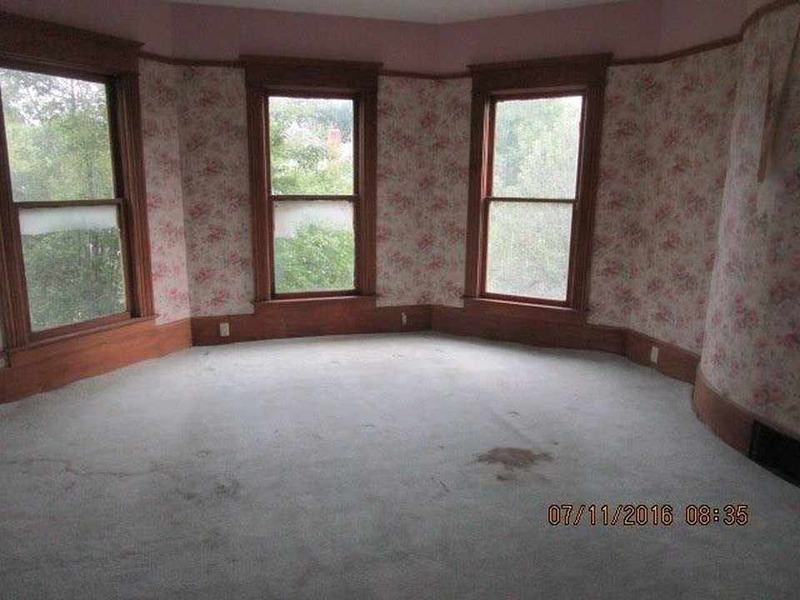 The inside wasn’t so bad then; there were curtains on the parlor windows and a rocking chair in the middle of the room, and it looked so cozy I wanted to sit and rock. Upstairs was still in good condition as far as I could tell, but I felt uneasy so I came out, and David was much relieved to see me. Last time we “visited” there was a “sale pending” sign out front, and I felt a little jealous, though I readily acknowledge that it could never be mine and I’m glad someone will fix it and hopefully love it as I have. God bless, and my best wishes to the new owner. The house has sold to a very capable family. We will be repairing it. Restoration to what it was is impossible due to the damage and stripping of the original fixtures. Please let me know if there is a current owner of this historic home and if they might be interested in an ornament of it that I obtained this summer at a garage sale. It is a beautiful ornament depicting the home as a G.F. Barber home that was built in 1905. It says: Goeller House on the inside of the little booklet. I have a paper attached to the ornament to send it to the current owners to put on their Christmas tree. I will send it at no cost to them as a gift from me to them with my very best wishes on the success of their restoration of this home! Even if not able to make it authentically correct, if they are just able to restore it in the Victorian era styling, it will be beautiful! Yes someone, unknown to me has purchased the home and is in the process of restoring it. Every time I drive past it I see a little more improvement. Yes, I would package up your keepsake and send it on to them with it addressed as Current Resident as I do not know the name of the folks that bought the mansion. Her first name is Diane. I stopped & We chatted for over an hour a few days ago. They have made great strides on the interior. The smoke from Calif. fires this summer kept them indoors. I am so glad they are restoring it and they plan on keeping it as their private residence.